The Mercurial Superfly is worn by some of soccer's fastest and most creative players with the likes of Cristiano Ronaldo wearing it exclusively. Boasting the latest in Nike innovation, the Superfly 6 has been engineered for speed. If you're the type of Mercurial player that can change the game in an instant, the Superfly is for you. The Mercurial Superfly is worn by some of soccer's fastest and most creative players with the likes of Cristiano Ronaldo wearing it exclusively. Boasting the latest in Nike innovation, the Superfly 6 has been engineered for speed. If you're the type of Mercurial player that can change the game in an instant, the Superfly is for you. The cleat for speedsters worldwide has been re-designed and is better than ever before. Channeling inspiration from nature's fastest creatures, Nike has created the ultimate high-speed footwear. The foundation of fast footwear originates with the fit. The Mercurial Superfly 360 wraps the entire foot in Nike Flyknit, hugging the foot and eliminating the gaps between soleplate and sole. 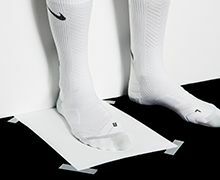 The Nike Mercurial Superfly 360 also boasts phenomenal traction, with chevron bladed studs aligned for maximum acceleration, while the skin of All Conditions Control has been embedded into the individual Flyknit yarn strands before the cleats upper is woven together. The result is the fastest cleat on planet. Accelerate your game when you shop at soccerloco for the Nike Mercurial Superfly 360.